Chicago Bicycle Accident Lawyer | Illinois Bicycle Lawyers at Keating Law Offices: Bike Thefts Leading to Vigilantes? Bike Thefts Leading to Vigilantes? On the tail end of a viral story of citizen vigilantism in Seattle, where a Portland bicyclist recovered his bike from his thief in Seattle, comes some tragic news about an incident that occurred in Belleville, Illinois. A 19 year-old male was arrested and subsequently sentenced to 11 years in prison after the fatal stabbing of an 18 year-old over a physical altercation surrounding possession of the reported stolen bike. The two news stories mentioned are indicative of the best and worst outcomes of a bike owner confronting the alleged perpetrator of their theft. While the Portland bicyclist was successful in not only retrieving his bike but in also having the perpetrator arrested, the outcome could have very easily taken a turn for the worse. That potential for violence and escalation is a reason why Bike Shepherd, a free registration database and service, strongly recommends that owners and witnesses of a bike theft not confront the thief, regardless of how damning the evidence is against the perpetrator. Rather than risking confrontation, people are recommended to contact the police; an action that was done by the Portland bicyclist, however, he erred by choosing to confront the thief prior to the arrival of the police. Understandably, bikes and their theft can create a lot of anger and inflamed emotions. Bikes are tools, but they are also someone's possession, sometimes the result of lots of money and/or lots of hours to create. There is a definite emotional connection between bikes and their owners. To limit theft, take advantage of the services available to bicyclists. 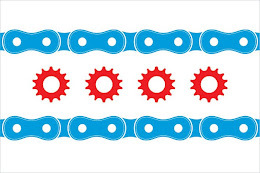 Registering your bike on Bike Shepherd, and the Chicago Stolen Bike Registry (an affiliate) is a first line of defense to bike theft. Use a decent to good U-lock or chain lock as a primary lock. Depending on your environment and settings, invest in a secondary lock, whether that is a cable lock or another U-lock. Use social media and forums as a way to coordinate with fellow cyclists in your area to track the whereabouts of your bicycle. And when applicable, call the police. This post was written by Paul Min, Legal Intern at Keating Law Offices, P.C. in Chicago, Illinois.